Stand up paddle boarding has grown to be one of the hottest summer activities in the world! Not only is it fun but it is an excellent way to get fit and stay active all summer long. SUP boards are continually evolving, with the latest craze surrounding inflatable boards. Inflatable SUP boards are fast emerging as the paddleboard of choice for novices and pros alike. If you are ready to get your inflatable SUP board vibe on this summer, you’ve got to know which board is the best for you! SUP boards are so much more than just a fun way to goof around on the water. They are used recreationally, for sport, and even for rescue. Lifeguards use them to propel themselves quickly through the waters when needed in an emergency; an idea they got from images of Native Americans standing in their canoes to navigate the difficult conditions on rivers. 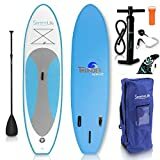 The inflatable Stand Up Paddle Board was created because most people don’t have access to a designated board roof rack on their vehicles and need something portable and convenient. So, What Is The Best Inflatable SUP Board On The Market? At first glance, it might seem like they all look the same. However, there are many different kinds of designs and variations that play a role in how, where, and by whom they should be used. Without further ado, let’s help you pick the board for your needs. Our favorite SUP board is the SereneLife Inflatable Stand Up Paddle Board. This board has an impressive design that will give you optimal paddling and surf control, which is of the utmost importance in this sport. The 30″ deck improves stability and balance while you are standing. This improvement in balance means you have superior maneuverability, which is an essential factor to consider if your SUP board is going to be used by beginner riders. The base of the SereneLife Universal has triple fins which help improve the board’s speed, steering, and handling abilities, making it an easy and practical choice for all age groups. When you have a solid stance and increased balance, you will find that even the most complicated maneuvers become more simple to do. The non-slip soft top-deck makes this design great for hesitant rookies of all ages. If falls do happen, there is a smaller chance of injury because the board is soft and has been specifically designed to adapt to its user. Because it inflates and deflates quickly and easily, it is ideal for storage and transportation. A complete paddleboard kit comes with the purchase. It includes an oar paddle, ankle cuff, manual air pump, patch repair, and storage bag. Best used for: the beach, lake, or river. Industry Leading Paddle Board Design. Unmatched Military Grade Durability & Quality. Xterra has long been an industry leader in paddleboard design. Their inflatable paddle boards are the perfect choice for anyone who wants years of fun and adventure on the water. It is an ideal inflatable SUP for both beginner paddle boarders and veteran riders. The Xterra Inflatable 10′ has equalizing balance capabilities because of its rigid six-inch base, making it easier to maneuver and control. 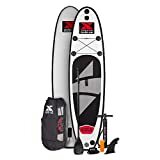 It comes with an adjustable aluminum paddle which allows the rider to change paddle length according to their height, a desirable perk for anyone who plans on sharing their board with someone else. Xterra makes durable, hard body paddle boards, and their inflatable ones are no different. The stitching is double reinforced, meaning that it won’t warp or lose shape over time. The sturdy materials and durability mean the board can withstand the roughest treatment. There is no need to handle it with kid gloves when you are out having fun on the water. Understanding that riders were struggling with transport, the folks at Xterra concentrated on developing an inflatable board that inflates quickly and can be carried anywhere. The air pump can inflate the board in under five minutes. When not in use, it can be kept in its carry-bag backpack. The bundle comes with a range of handy accessories: Double action pump with pressure gauge, adjustable paddle, detachable center fin, ankle leash, and a repair kit are among some of the essential you will find inside. We have no hesitation in proudly recommending this SUP board as our runner-up. Best used for: salt and fresh water, on rivers, lakes, streams, and oceans. The Most Versatile Inflatable SUP Available. This is the ultimate inflatable SUP/Kayak convertible package. The SUP board itself is made from ultra-strong military grade PVC with overlapping stitches in the seams for maximum strength, rigidity, and durability. The board’s strength and stiffness are guaranteed to be between 12 to 15 PSI which makes for a supremely firm ride, perfect for cutting through choppy waves. The Bluefin’s dimensions come in at a comfortable 12′ long, 30″ wide, and 6″ thickness. Veteran riders know it as the most versatile SUP, making it ideal for white waterboarding, surfing, touring and racing. If you love SUP yoga and Pilates, this is the inflatable board for you. The package contains a dual action pump, carry bag, removable fin, repair kit, and a seat for kayak conversion. There is a three-piece SUP/ Kayak sports paddle as well. Best used for: surfing, touring, white water-boarding, racing, yoga, and Pilates. This is a fair question because SUP boards aren’t cheap (priced anywhere from under $500 to $3000)! The life of a board is contingent on many factors, including how advanced the user is, how frequently they plan to use it, and under what water conditions. The Inflatable SUP boards listed are manufactured using the highest standard of materials. It is difficult to say with certainty how long one will last because of the circumstances listed above. However, inflatable SUPs can take a fair amount of abuse. If you look after yours carefully, it will last for decades. Can You Leave an Inflatable SUP Inflated? Yes, you may leave your SUP inflated if it is maintained under certain conditions. Keep it out of direct sunlight when stored, and in an environment where the temperatures are ambient. If your board gets too hot, the air inside may expand and cause irreparable damage. Over time, your SUP may become slightly deflated and need to be topped up with more air. 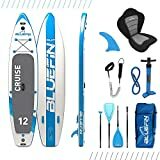 What Size SUP Board Should I Get? When you are shopping for paddle board, you should keep in mind that you will need one that can provide enough stability and flotation for its primary user but is easy to handle for your level of skill and body weight. At the same time, it must be fast enough to give you a satisfying ride and suit your paddling style. The most popular SUP board size for general use is 10 to 11 feet in length and 32 to 34 inches wide. If you are a beginner rider, you will want to lean toward a board that is closer to 34 inches wide for the added stability. There are some wider options, but the board will be less fun to paddle as it will go slower. Why Own an Inflatable SUP vs. Fiberglass SUP? One of the main differences between an inflatable SUP and a fiberglass one is their overall performance. Even though advancements have been made over the years to make inflatables more rigid, their overall responsiveness and feel are not the same as that of a fiberglass model. This should not be a concern to anyone using a SUP board for the first time; only veteran riders should weigh the pros and cons of which material they prefer. Inflatables are more comfortable to stand on during long paddling sessions. Depending on the PSI, the ride on an inflatable is just as smooth as fiberglass. Inflatable SUPs are more convenient to transport and are easy to store. Inflatable SUP Boards are the perfect piece of equipment for riders of all levels. If you are just getting started in the exciting world of Stand Up Paddling, these are the best inflatable SUP boards the industry has to offer. If you are serious about taking up this exciting sport or looking to upgrade to something more suitable, you can do no better than buying one of these inflatable SUP boards!